Bobby Borislav Sarafov, the son of the Head of the National Investigation Service, Borislav Sarafov, was born in 1997. 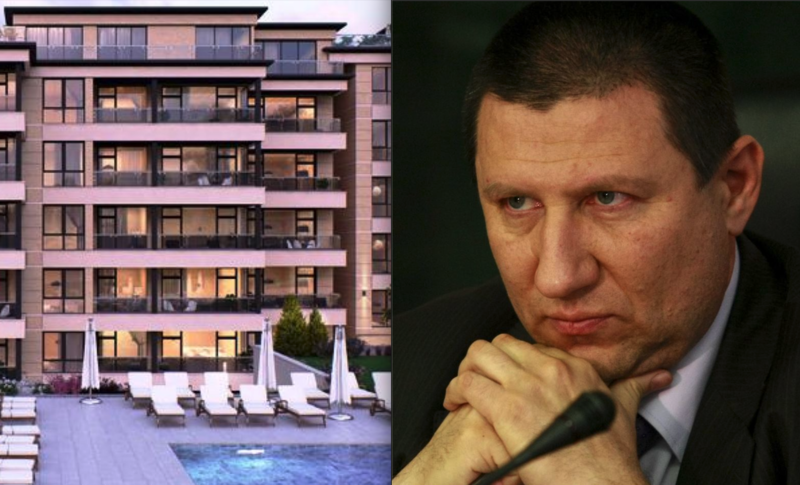 In 2018 and 2019, he bought an apartment, an atelier and a garage in the “Edelweiss” luxury development in the affluent Sofia suburb of Boyana for a total of BGN 540,000. It would be difficult for the young man to explain the origin of the money, as he has no participation in companies and no mortgage loans. His father, Borislav Sarafov, has not declared such amounts before the Inspectorate of the Supreme Judicial Council (SJC). The price of the apartments definitely seems preferential. Similar properties available on the market are considerably more expensive, according to Bivol’s research. Bobby’s first property acquisition happened on August 9, 2018, when he bought a 133,700 square meter atelier with a 76,80 square meter terrace for BGN 291,030 and a garage of 57 square meters for BGN 57,600. Moreover, if the price of the garage corresponds to the market one, Bobby would have to pay at least an additional BGN 80,000, according to the posted prices on the site of the “Edelweiss” development. The second apartment was bought on March 12, 2019, and again it is listed as an atelier (studio). It is actually a 122,200-square-meter penthouse with a terrace of 86,50 square meters. The price was only BGN 192,000. Such a penthouse is currently available on the site of the “Edelweiss” development for EUR 189,000. Only a month before this acquisition, Bobby managed to sell a panel apartment in the more modest Sofia neighborhood of “Lyulin” with an area of 65 square meters for BGN 132,966. The comparison between the real market prices in “Lyulin” and “Boyna” speaks for itself and for the far-from-reality price at which the young son of the senior magistrate bought his property in “Boyana”. The data for these purchases came from the automatic system created by Bivol to search for suspicious deals with companies close to the government. It can be used to search by keywords: name, location, company, etc. At present, there are about 3,000 entries in the system and for 200 of them, the deal prices have been searched. In the case of Bobby Sarafov, the deal had been concluded with the company “Edelweiss – 3 Boyana”, which until 2015 was owned by Arteks Engineering and now owns “Euro Property BG”. The more serious problem of Bobby and his father is that there is no way to prove such income. Indeed, in recent years, the family has been selling old properties, but the sale amount is not enough for the new acquisitions. In addition, there is no data on a mortgage loan granted to either Bobby or his parents. In 2017 and 2018, Bobby’s parents have sold two smaller homes in Sofia for BGN 97,000 and BGN 86,000 or a total of BGN 183,000. Moreover, in 2019, Bobby’s aunt – Sarafov’s sister – donated to him a heritable panel apartment of 65 square meters in “Lyulin”. As we mentioned above, Bobby Sarafov managed to sell it very gainfully for BGN 132,966. Altogether, the proven family revenue from real estate sales amounts to a total of BGN 315,966, which is insufficient to cover even the declared spending of BGN 540,000 for the new luxury apartments of Bobby. Who is Sarafov and who will investigate him? Former Deputy Prosecutor General Borislav Sarafov was elected by the SJC as the head of the National Investigation Service in 2017 as the only candidate for the post. Previously, he was involved in several scandals, including arrogant behavior and threats against an investigative police officer, as well as an insult to investigator Strahil Kamenichki working on the case with the deadly train explosion near the village of Hitrino. Kamenichki has even filed lawsuits against Sarafov, but they have been suspended because of Sarafov’s immunity. The data on Sarafov’s son’s doubtful gains are grounds for him to be checked by the Committee for Combatting Corruption and the withdrawal of illegally acquired property (KPKONPI) (sic), but its Chairman was also seriously implicated in the “AparmentGate” scandal after it became clear that he had systematically listed property deals at prices much lower than the market ones. One of the hypotheses is that this has been done to cover a lack of legal revenue for the acquisitions. Meanwhile, Chief Prosecutor Sotir Tsatsarov, before taking office in 2012, was also exposed by Bivol in declaring properties at 1/1,000 of their real cost. He then commented that this was a normal practice in which he did not see anything wrong.